Pity the lowly cabbage, which doesn’t get the love of its sexier brassica brothers and sisters such as Brussels sprouts, broccoli, cauliflower or kale. But this overlooked vegetable is plentiful and inexpensive at this type of year. 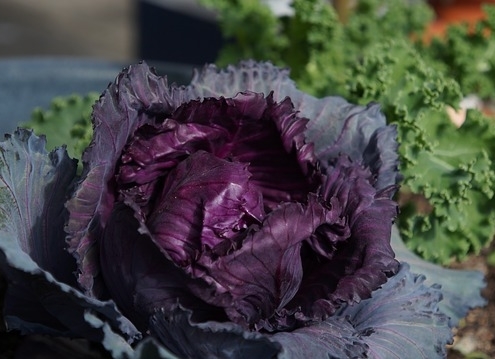 Cabbage is also a breeze to grow and does great in cool spring and fall temperatures. They actually taste sweeter when exposed to light frosts as do other cool-season brassicas. It comes in two types: European and Asian. The European types are white or green cabbage, red cabbage and savoy. The most popular Asian types are bok choy and Napa. Napa is an excellent choice for summer slaw when combined with grated carrots, red bell peppers and simple soy and rice-wine vinegar dressing with a touch of honey. Toss in some peanuts for crunch and/or cooked chicken to make it a complete meal. But today we are focusing on a couple of winter cabbage recipes. If the taste of cabbage doesn’t convince you then maybe this will: cabbage is full of vitamin K and anthocyanins that help with mental function and concentration. These nutrients also prevent nerve damage, improving your defense against Alzheimer’s disease and dementia. Red cabbage has the highest amount of these power nutrients. Cabbage is an excellent source of vitamins C, B1, B2 and B6. It is also a very good source of manganese, dietary fiber, potassium, folate and copper. Additionally, cabbage is a good source of choline, phosphorus, magnesium, calcium, selenium, iron, pantothenic acid, protein and niacin. The red coleslaw is a family Easter favorite that is great as a side with ham and scalloped potatoes. Notes: If you use savoy cabbage it will not take as long as green cabbage once it is added to the pot to steam. Cut out the cabbage core and finely chop it. Cut the leaves into fine shreds or about 1/8-inch ribbons. Heat 1/4 cup olive oil in a large pot or Dutch oven over medium heat. Add the onion and cabbage core, some salt and pepper, and cook, stirring frequently, until the onion starts to soften but is not yet browned, about 5 to 7 minutes. Add the garlic and cook another 3 to 5 minutes, until the garlic softens too. Add the shredded cabbage leaves and herb sprig. Reduce the heat to medium-low and cover the pot and let it steam a bit to soften the leaves, then toss the cabbage to combine with other ingredients. Cook, covered, until the cabbage is very sweet and tender, which may take 30 minutes or as little as 15 to 20 minutes, stirring occasionally. Meanwhile, in a small skillet, heat 2 Tablespoons of olive oil over medium and add the uncooked farro. Toast it, stirring, for a few minutes, until half a shade darker. When the cabbage is ready, stir in the vinegar. Taste and season with more salt and pepper. Add toasted farro and stock. Bring mixture to a low simmer and cook for 25 to 35 minutes, until farro is tender and all the flavors are married. The soup will be very thick, but if you’d prefer more liquid, add another 1/2 cup stock. Taste and adjust seasoning again. Stir in lemon juice. Ladle into bowls and finish each with a drizzle of olive oil and a shower of parmesan, with more parmesan passed at the table. Soup keeps well in the fridge for 3 days and for much longer in the freezer. Put all in a blender and blend for 1 minute. The vinaigrette will keep for 5 days and after prepared, the salad will keep for two days in an airtight container. and more on planting Cabbage and other uses, here.